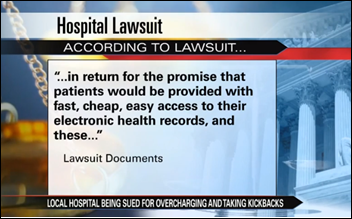 A newly unsealed state court lawsuit claims that 62 Indiana hospitals fraudulently attested for $300 million in Meaningful Use money because they don’t give patients copies of their medical records within three business days 50 percent of the time as required. Two lawyers filed the suit after testing four Indiana Hospitals with a records request. They say that none of the hospitals delivered their records promptly even though all the hospitals reported that they had done so. Their statistics were extrapolated to other state hospitals to assume that they, too are not following through on patient records requests in a timely manner. Also named in the lawsuit is records release vendor Ciox Health, which the plaintiffs say illegally profited from overcharging patients for their records in violation of anti-kickback laws. From Uncle Douger: “Re: HIStalk reporting bias. Have you looked at who is making those claims as article comments? I would be suspicious.” I will only say that those commenters claiming that I’m biased against any given company often use IP addresses owned by that same company. 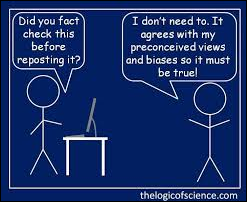 Today’s anti-journalism environment encourages anyone who doesn’t like particular facts to accuse those who present them of bias. There’s nothing I like more, however, than having my own opinion — when I actually state one — challenged and occasionally changed by rational and well-considered facts. From Apple Alar: “Re: billion-dollar lawsuit against ECW. It’s interesting that it was filed as a class action suit rather than wrongful death / malpractice. The implications for setting a legal liability precedent for a vendor involving the content of the electronic health record would be game-changing. 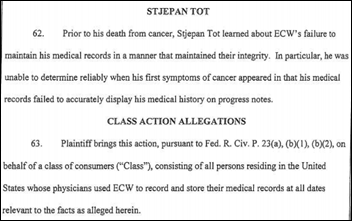 What about systems that send information to the EHR that is improperly presented there?” I don’t really know what to make of the lawsuit since the plaintiff made vague claims that her husband’s cancer wasn’t diagnosed because of EHR issues, but she wasn’t specific and didn’t name any doctors or hospitals as defendants. It also copied and pasted a lot of information from the DOJ’s settlement with ECW, which I took as an indication that it was a me-too claim hoping for a quick settlement from a company trying to distance itself from its $155 million payout. Attorney readers, what do you think? From ExEpic: “Re: HIMSS compensation survey. They don’t even list Washington, DC as an option for the state or territory of residence.” I checked the survey and it asks, “In which state do you work?” in omitting DC but including an “Other US Territory” option. I was reviewing the rehearsal of Thursday’s excellent webinar by PatientSafe Solutions and took note of the “wireless wellness” problem mentioned by both CIO presenters. It was a key lesson learned – every new application that would use the wireless network must be tested because some of them are poorly designed and could mess up other apps. The Boston business paper reports that while Athenahealth is selling its Bombardier Challenger 300 jet in a cost-cutting move, it will keep its second aircraft, a propeller-driven Pilatus PC-12. I was curious about the cost of the Challenger – $24 million new with an operating cost of $7,250 per hour. 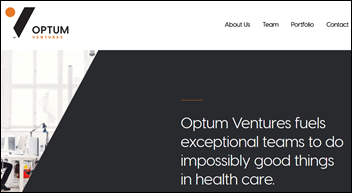 UnitedHealth Group’s Optum launches a $250 million fund to invest in early-stage healthcare startups, including digital health. If you’ve started a crappy company that everybody else’s digital health fund has passed on, here’s your chance. Bloomberg predicts a wave of bankruptcies involving hospitals and healthcare vendors in 2018, especially for disproportionate share hospitals whose funding has been cut. 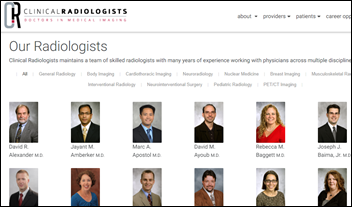 The Clinical Radiologists radiology group chooses MModal for radiologist documentation, real-time physician documentation, business intelligence, critical test results management, and peer review and learning. Athenahealth names Marc Levine (JDA Software Group) as CFO. University Hospitals (OH) rehires Robert Eardley (Houston Methodist Hospitals) as CIO. Vice-Admiral Raquel Bono, MD, MBA, director of the Defense Health Agency, accepts the HIMSS Federal Health IT Award. John Halamka, MD will serve as editor-in-chief of the new open access, online journal Blockchain in Healthcare Today. Another site run by the same company runs ads, so I assume this one will, too. Health coaching app vendor Farewell names former US Surgeon General Richard Carmona, MD, MPH to its board. He’s also a combat-decorated Vietnam veteran and a Special Forces medic who also earned an AA degree in nursing and accumulated many awards as a deputy sheriff and SWAT leader. 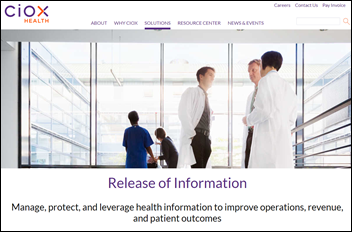 Patient engagement software vendor Relatient hires board director and venture capital operating partner Michele Perry as CEO. 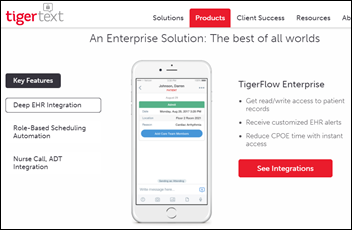 TigerText announces TigerFlow Enterprise, a clinical communication and collaboration platform. Unified clinical communications platform vendor Telmediq integrates the IPhone X’s Face ID authentication. A Medscape survey of 4,000 physicians finds that half have been sued for malpractice, noting that New York OB/GYNs pay nearly $200,000 per year in malpractice premiums. Sixty percent of doctors said they were either encouraged or required by their insurer to settle their case, with two-thirds of those resulting in payouts of less than $500,000. 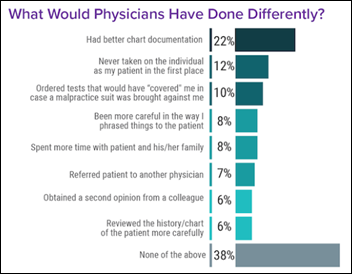 A surprising 62 percent of doctors said the outcome of the lawsuit against them was fair, but one-third of those sued said they no longer trust patients, treat them differently, or left the practice setting after the lawsuit. Three-fourths of doctors in general say the threat of malpractice influences their actions. Doctors say the best ways to discourage lawsuits include communicating more effectively with patients, screening cases for merit by a medical panel, capping non-economic damages, making the plaintiff responsible for paying the legal fees of both sides if they lose, and banning lawyers from taking cases on contingency. 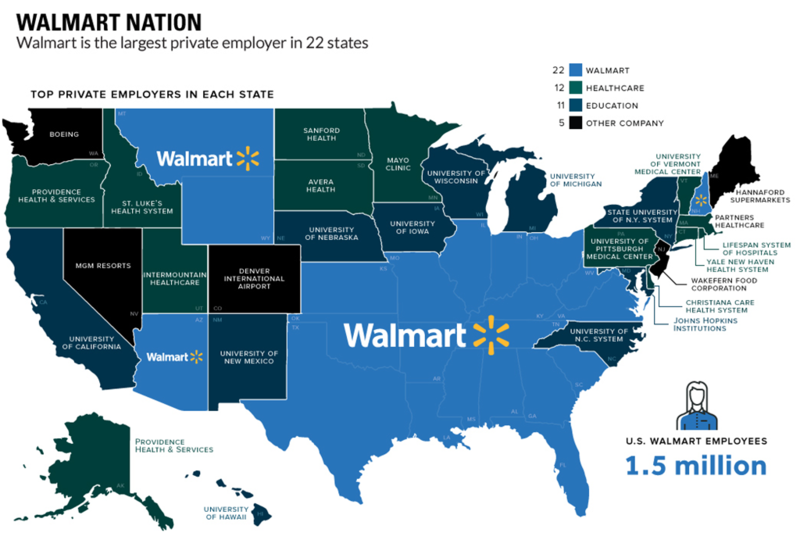 An interesting graphic (click to enlarge) shows that Walmart is the largest private employer in 22 states, but also unintentionally illustrates that 12 states have a health system as their largest employer. Unlike Walmart, those systems are tax-exempt and create profits that often involve less-direct societal costs in the form of Medicare and Medicaid. 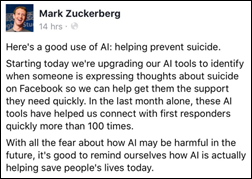 Facebook upgrades its AI tools to identify users who are expressing suicidal thoughts so they can be connected to first responders. 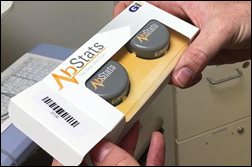 CNBC profiles Cedars-Sinai testing of AbStats, a stomach-attached wearable that analyzes bowel sounds to alert doctors that their post-op patients are capable of eating. The hospital is also testing the device to alert users that their stomach is empty so they eat only when it’s time. The inventor of AbStats is Brennan Spiegel, MD, MSHS, director of health services research at Cedars-Sinai. 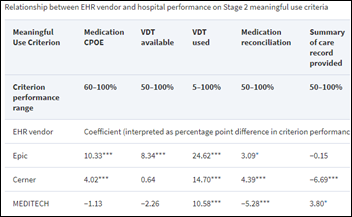 A JAMIA-reported study finds that hospital Meaningful Use performance is associated with the EHR they use, with Epic users scoring higher in five of six criteria. The article – which is of the “let’s merge some government databases and see if we can find something to publish” type — duly notes that correlation does not necessarily indicate causation, as hospitals that use Epic, for example, might well have different resources and motivations than those that don’t. It also correctly notes that MU criteria have little to do with patient outcomes. In that regard, I don’t see one iota of usefulness in the study, especially since the information is hardly actionable even if valid. 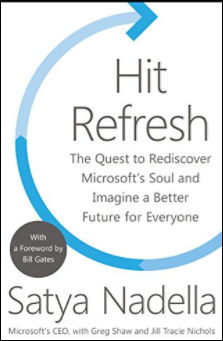 It also fails to note that presence of EHR functionality (as measured by certification) doesn’t do anything to meet hospital MU requirements — the hospital creates and actively enforces policies on EHR use (maybe Epic-using shops just press their doctors harder to chase MU targets). I’ve seen sites pushing sensationalistic headlines around this article and interpreting it wildly incorrectly, making it even worse and more like an Epic commercial. A JAMA op-ed piece proposes – not very convincingly – the creation of a “medical virtualist” specialty, with the proposed required training including “webside manner,” competency in conducting virtual examinations, and including families in virtual visit. It’s not clear why those specific competencies should not be included in regular medical education or as a certificate (no different than learning to use a particular EHR) rather than carving out yet another self-serving, expensively maintained medical specialty. 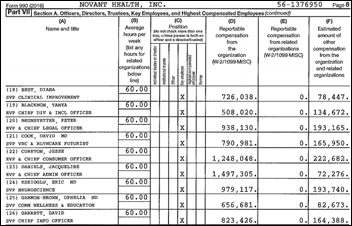 The local paper notes that the CEO of Novant Health (NC) has had a 93 percent salary increase since 2012, with total 2016 compensation of $3.4 million. SVP/CIO Dave Garrett was paid $990,000. The surgeon treating the minor tongue condition of a five-year-old asks the mother if she wants her daughter’s ears pierced while she’s under anesthesia, so she says OK. The daughter leaves with a repaired tongue, a pair of earrings installed, and an extra $1,900 bill for “operating room services” that her insurer refused to pay. Children’s Hospital Colorado demanded that she either write a check or deal with its collections agency, but eventually waived the charge. Meanwhile, one of the piercings was off center and had to be redone at a mall kiosk, which set her back another $30. Netsmart recognizes its employees in honor of Giving Tuesday. Ivenix will demonstrate its infusion system at the ASHP meeting in Orlando December 3-7. The Washington Stat Health Care Authority certifies consumer decision aids from Healthwise for knee osteoarthritis and hip arthritis. Nuance launches its AI Marketplace for Diagnostic Imaging. 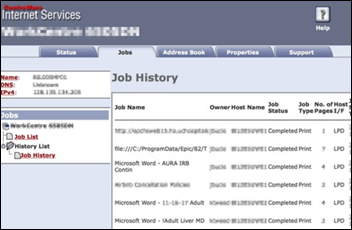 Endpoint management software vendor Igel will integrate its product with Imprivata’s OneSign SSO after joint work at Parkview Medical Center (CO). 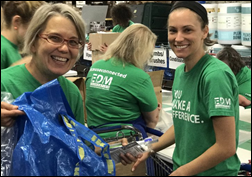 AdvancedMD Cares makes 600 quilts for three Nashville charities during its Evo17 conference. The Boston Globe includes Definitive Healthcare in its list of Top Places to Work in Massachusetts for 2017. MModal extends its Speech Understanding technology to the PACS desktop in a unified workflow. Forbes features Kyruus co-founder and CEO Graham Gardner, MD in its look at how AI and digital will shape the future. Arcadia Healthcare Solutions sponsors the Millenium Alliance Healthcare Payers Transformation December 7-8 in Nashville. Besler Consulting publishes an analysis of the 2018 OPPS Final Rule. 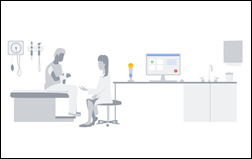 Change Healthcare announces a strategic relationship with Google Cloud. CoverMyMeds will exhibit at the American Society of Health System Pharmacists Midyear Conference December 3-7 in Orlando. 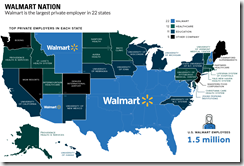 Re: Walmart is the largest employer in 22 states. I’m not sure what you mean “Unlike Walmart, those systems (healthcare systems) are tax-exempt and create profits that often involve less-direct societal costs in the form of Medicare and Medicaid.” Yes, most healthcare systems are tax-exempt organizations, however, their employees typically have health coverage plans as an employee benefit, thus healthcare systems do not shift the burden of employee health benefits off to the taxpayer. Walmart, on the other hand, is an employer who has a significant amount of employees who have Medicaid as their health plan. Walmart encourages their employees to sign up for Medicaid, thus shifting the burden of health coverage for their employees off on the tax paying public. Gotta love American corporations making America great again. I meant to say that tax-exempt health systems create their own demand, with much of their resulting revenue and profits paid by taxpayers in the form of Medicare and Medicaid. I would be interested in an economist’s opinion on ever-enlarging health systems that provide employment, but at a significant cost to everybody else (even their own employees) who is negatively impacted by the cost of healthcare services, insurance, or a possibly lower salary because employers are footing some of the bill. I would argue that a state with a health system as its largest employer is a sign of economic failure rather than success. The cost-reporting I’ve seen doesn’t always substantiate that a health system’s profits are a result of Medicare and Medicaid. Mayo, as example, is a profitable organization, yet doesn’t provide services that are reimbursed by Medicare and Medicaid. That said, I am amazed, however, that healthcare organizations are able to retain their tax exempt status, when indeed, they are profitable and often their spending is not in the public (nor employee’s) best interest. I agree that a state that has a health system as its largest employer is an economic failure. Can Weird News Andy top this? Not exactly snakes on a plane. LeftCoaster spouts a fully unthoughtout truism. If Walmart didn’t employ it’s associates, they would be unemployed – and therefore, still on Medicaid. This means that Walmart is not shifting healthcare costs onto the tax paying public, they are merely not taking on the additional burden of healthcare costs as part of the employer/employee relationship. If Walmart didn’t employ their associates Walmart wouldn’t be in business. An American corporation not taking responsibility for employees by providing a reasonable livable wage, as well as basic health benefits, let alone shifting the cost of an employee’s health to taxpayers is absolutely appalling (and spelled g-r-e-e-d) – even more so now that the Walton family stands to significantly benefit from the new tax legislation. LeftCoaster, what is a “livable wage” This should be good.